Reserve-price auctions on eBay have an extra feature. In addition to a minimum bid, which is required in any eBay auction, a reserve price protects sellers from having to sell an item for less than the minimum amount they want for it. 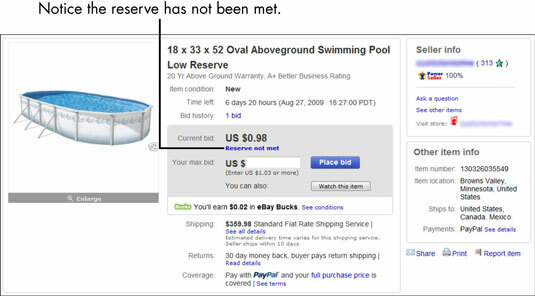 An eBay auction with a reserve is shown here. Suppose that you see a 1968 Jaguar XKE sports car up for auction on eBay with a minimum bid of only a dollar. It’s a fair bet that the seller has put a reserve price on this car to protect himself from losing money. The reserve price allows sellers to set lower minimum bids, and lower minimum bids attract bidders. Unfortunately, if a seller makes the reserve price too high and it isn’t met by the end of the auction, no one wins. Nobody knows (except the seller and the eBay computer system) what the reserve price is until the auction is over, but you can tell from the auction page whether you’re dealing with a reserve-price auction. You have to open the specific auction page to find out whether it has a reserve. If bids have been made on an item, the auction page also shows a message telling you if the reserve price hasn’t been met.